This is one of those “holy grail” albums that I want for my collection really badly. 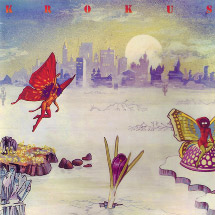 Krokus has been one of my favorite bands since 1982 when I first heard ‘Long Stick Goes Boom’ (from ONE VICE AT A TIME) on a local Metal radio program. Shortly after, I started reading more and more about the band in magazines like Metal Forces, Circus, and Hit Parader. Aside from filling a hole in my Krokus collection, this album stands out as a must have because it is the only album to not feature either guitarist Fernando Von Arb or vocalist Marc Storace. 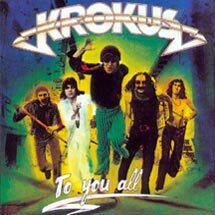 Most people believe that Von Arb started the band but it was really long time bassist/keyboardist Chris Von Rohr who founded Krokus and actually sang lead vocals on this album. I’ve seen this album twice on Ebay but the price was $100 U.S., this was around 1999. It’s very rare and out of print and is only available on vinyl. I need the second album too! TO YOU ALL brings classic Krokus members Fernando Von Arb, Freddy Steady, Tommy Keifer and Jurg Naegeli into the fold joining Von Rohr…..this was actually a joint effort between Krokus and Von Arb’s band Montezuma (with Naegeli & Steady) under the “Krokus” banner. It’s also the beginning of the band using the famous Krokus logo. This ones pops up on Ebay once in awhile on CD for about $35 from Switzerland. The Krokus website says that a Swiss company released it on CD but I’m skeptical on the authenticity, it could be a bootleg. I had a sealed copy of the LP in my hands in 2000 at a record store in my hometown and the price was the original $25 price tag from back in the ’80s for the import. I hadn’t been in the store in years so when I put it down and checked out the rest of the store, the owner grabbed it off the rack and slapped a fresh tag on it for double the price! I had been a regular at this particular store since I was a young kid and I knew the owner was a shady guy with a lot of questionable business practices as years went on so I wasn’t surprised to find a new sticker. Obviously I passed. Anyone with any leads on these two albums, please contact me through the contact page of the website. I have a sealed – unopened album ( KROKUS one vice at a time by Arista ) dated 1982 . Please let me know if this is what you are looking for !! I have MP3’s of the first two KROKUS albums if it helps tide you over till they are released or you happen to find the originals. I have MP3’s of the first two KROKUS albums if it helps tide you over till they are re-released or you happen to find the originals.